I love reading, but with the happy arrival of my baby girl, I don't really have much time for it. These days the only opportunities in which I find myself lost within pages are in the dark hours when my gorgeous baby girl decides she will rather stay up than sleep like normal people! So in these times I have been reading mostly short story anthologies. I've forgotten how much I love reading them. From a writer's perspective it's great to have an opportunity to explore lots of different writing styles and genres in a small amount of time. You can learn a lot about the craft of writing through reading short stories. 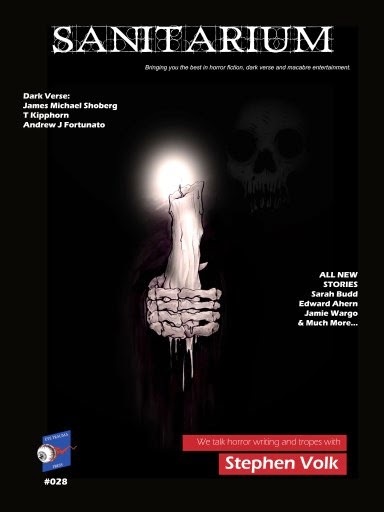 I'd heard about Sanitarium Magazine whilst researching magazines to send my short stories to and amazingly they published one. Consequently I rushed out and bought it, nothing beats seeing your own work in print. P.S I'm in this issue but it would be a bit weird to review myself. I loved the imagery within Marmont's dark and seductive writing style which she builds with minimal effort, the words are alive on the page. With writing that is so enticing, there's barely a need for a plot. It comes as no surprise to see in her bio that she has a talent for writing poetry as well. This little tale draws you immediately, did he or didn't kill someone? Did his car really kill someone? Can cars do that?! An unusual horror story. There's a great streak of dark humour in Davidson's words which lures you into a false sense of security until its gets really dark, and the ending is pretty neat too. A curious tale about a strange and mysterious missing uncle and a rattled maid who seems to be hiding some truth. The protagonist Mr Bence finds himself trapped in a dark family history full of ghosts, spirits, and of course a benevolent wolf hungry for more than just meat. A killer virus has taken hold of a community but can anyone stop the spread before it's too late? How is it spreading or more worrying who is spreading it? There's a palpable tension that builds throughout, Ahern is clearly a very experienced and accomplished writer. The incorporation of real life historical figures gives it a realistic and believable feel which adds to its terror. For me this tale had the feel of a supernatural episode of the brilliant tv series - 24, starring Keifer Sutherland as Jack Bauer. Spineless is a very short short story that is expertly given, I don't want to say too much about it incase I give anything away, except that it is very unusual and very clever. A deeply unsettling tale of enduring suffering and loss, the consequences of making bad decisions and the atonement for macabre sins. Wargo is great at spinning a tale that is truly horrifying. Beware the Midwest mangler! Hanks tale touches on real lfe scary issues that we all fear such as betrayal by the one you love the most and scary car journeys on your own in the dead of night. This is a great tale that makes you ponder even after the last word has been ingested, can't say too much about it incase too much is revealed, but it's good!